The stars of BBC Radio 4’s ‘The Croft & Pearce Show’ (2016), Spirit of the Edinburgh Fringe award-winners and receivers of the official Edinburgh Fringe (2016) TOTAL SELL OUT SHOW laurel, present their brand new sketch show! This dynamic duo are fast gaining recognition for their unique brand of sketch comedy which cleverly interlinks a wide range of immaculately written and beautifully performed characters. Hannah Croft and Fiona Pearce are comedy actresses of exceptional talent and are returning to Fringe 2016 with another hour of sketch comedy that is beautifully linked. Each vignette is funny in its own right, but with the immaculate writing and storytelling, they link seemingly unrelated characters into a complete story with consummate skill. Another touch I like about all their performances over the years they breathe life into some of the same characters that have cropped up in previous years productions. It isn’t necessary to have seen the previous shows, but if you have then it adds to the enjoyment for me anyway. Characterisation is well defined, be it the suicidal returnees Jean and June, Melissa the bosses daughter who sings throughout the day, the Geordie Brown Owl, the bullied brownie or Aussie relations Dougie and Barb are amongst the highlights. Although trapped in a shipping container in essence the actors create an illusion of space venturing in the audience at times to get assistance from a punter or two to flesh out the process. This is a very good show well worth catching and a nice way to start off the Fringe Day. For me I am already looking forward to next year’s instalment. 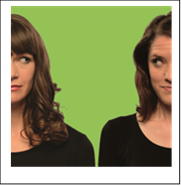 HANNAH Croft and Fiona Pearce are remarkably fresh-faced to be billed as Fringe favourites, but that they are. The full houses are not only a sign that their characters found their way on to Radio 4 earlier this year, but also down to substantial return business. The cast of characters has been developing and now many have the fully rounded feel that should lead from radio to TV. Like all good sketch comedy, it worked on radio due to the quality of the writing and performance, but watching the interplay between two, who have known one another since schooldays, makes every creation from the Geordie Brown Owl to the office temp waiting for her big break in musical theatre really fly. There are few props and the most basic of costumes, with most performed in jeans and T-shirt, but it’s easy to see how they will translate to a full production. They are also smart enough to know which are strong enough to reintroduce at different points throughout the hour. A slight rejig to place the opening sketch, probably the weakest, further in to the hour would have given a full house of stars, but there’s time. They’re on ‘all ruddy month!’, proclaims the Twitter of this talented sketch pair, sending up their own plummy delivery. It’s getting tougher to catch them, though, as they’re selling out from good word of mouth, plus their own successful Radio 4 show earlier this year. Fiona Croft and Hannah Pearce are Oxford-educated drama students, with a show full of the stereotypes they know those labels conjure up: there’s an irritating musical theatre wannabe, Melissa, practising Cats ballads in the law firm where her senior partner dad has wangled her a temping job; or the well-intended, prominently toothed, upper class Dan, repelling his girlfriend with OTT displays of romance.